Assistant Professor of Music. Dr. Bonus maintains a varied career as musicologist, early-music instrumentalist, composer, and conductor. In recent years, he has presented lectures about musical time, metronome technology, and performance practices at academic conferences across Europe and America. He has performed with Los Angeles Master Chorale; Apollo’s Fire: The Cleveland Baroque Orchestra (baroque trumpet) and Boston Early Music Festival Orchestra, whose recording of Psyché by J.-B. Lully on the CPO label was nominated for a Grammy Award. His discography also includes recordings by Centaur Records and Forces of Virtue Records, which he founded in 2003. Forthcoming publications include entries on the metronome, musical clock, and mobile phone for The New Grove Dictionary of Musical Instruments, as well as the Handbook of the Metronome for Oxford Music Online. In 2011, The American Council of Learned Societies awarded Alex a selective New Faculty Fellowship. 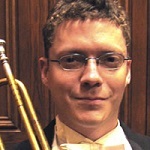 Alexander previously taught at Duke University and Case Western Reserve University, where he received a PhD in Musicology from Case Western Reserve University in 2010. He also holds MM and BM degrees from the Eastman School of Music.